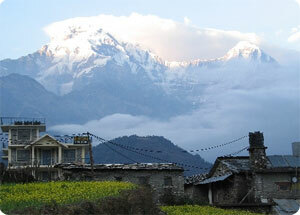 Siklish trekking is short and popular trekking destination in Annapurna trekking trail. This is trek to an area very less frequented by westerners to one of the largest Gurung villages in west Nepal . Siklish Trekking starts with a drive from Pokhara to Lampata and passes through Ghale Gaon and over the pass to Parje and Siklis - largest Gurung settlements. From Siklis, the route turns east and stays along the ridge through Kalikathan and Shyaklung with a final night at Chisopani before descending to Pokhara via Rupa and Begnas lakes. Siklish Trekking probes an un crowded corner of The Annapurna Conservation Area under the shadows of Lamjung Himal and Annapurna II and IV. This fabulous camping trek takes you about a week, starting at Beganas Tal (Lake) and heading north to the Madi Khola, then following the river''s west bank up to well-preserved Siklish (1,980m. ), Nepal''s biggest Gurung village. From here you strike westwards over the thickly forested ridge that separates the Madi and Seti Khola drainage’s and then descent via Ghachok, another Gurung settlement. Ending at: Return by bus /flight from Pokhara to Kathmandu..
Mode of trekking tour: Camping treks only. Himalayan sights: Dhawalagiri, Nilgiri, Annapurna Himalaya range, Hiunchuli, Lamjung Himal, Machhapuchhare etc. Day 01: Arrival in kathmandu 1334m, transfer to hotel , Siklish trekking briefing with officially arrangements. overnight at kathmandu. Day 03: Pokhara drive to Bijaypur Khola and trek to Thulakot. Day 04: Thulakot to Taprang and overnight (5 hours). Day 06: Lamakhet to Siklish and overnight (4 hours). Day 08: Siklis to Thumke-Danda and overnight (5 hours).